More than the other temperaments, Idealists are likely to want a career which makes them feel that they are giving back to the world. They also desperately seek meaning in their professional lives, which isn’t always easy to find in the 9-to-5 world of pushy managers, schedules, rules, and number crunching. This is why so many NFs are drawn to self-employment. They often see it as a means of self-expression and seek to make their careers an extension of who they are. Many artists, entertainers, performers, and writers are NF Idealists, and many more own successful and interesting businesses. Because they are so good with people NFs make wonderful salespeople, though they sometimes lack the necessary “abilty to lie” to really make the big bucks in such a profession. An NF will struggle in a traditional job unless they see it as meaningful and worthwhile. Often they will get caught up in crusades against “the bad guys” like big corporations, big business and other authority figures. Sometimes this can be carried a bit far, as the NF will lose sight of the facts in exchange for the big-picture ideal of a perfect world. However, this visionary trait will serve them well if they want to start a people-oriented business that will help change the world. NF Idealists really can make a difference. Passionate and focused, ENFJs are great “people people.” While some may find their gregarious and helpful nature a bit overbearing, they are wonderful at winning friends and providing for others. If an ENFJ wants to start their own business, they should use their people skills to their advantage. They make great teachers, counselors and advisors. Once an ENFJ finds the right group of people, they can begin their enterprise fairly quickly. First, choose the type of business you would like to run, and use your organizational and networking skills to get your clients interested in your idea. Your powers of persuasion and ability to win people over are almost unmatched, so it will not be hard for you to get new clients! Make sure that you leave room open for new possibilities within your plan – if you think too far ahead and get too caught up in sticking to your original business idea it might make you a bit less flexible to see alternatives. An ENFJ is probably less concerned about running their own show than they are about connecting with helping people. I can’t imagine a worse profession for an ENFJ than sitting in an office all day as a bill collector or helping a big company get a bit more money out of their customers by being sneaky. ENFJs need to put good into the world, or their business will feel empty and meaningless. 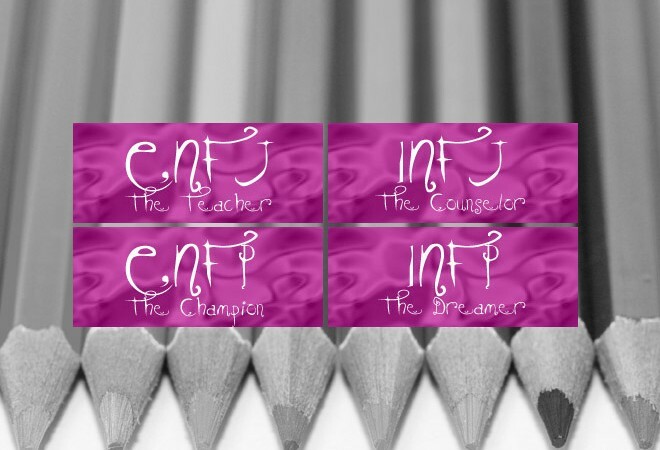 Champion of the cause, the ENFP is passionate, effervescent and charming. Whatever undertaking they choose, you can be sure they will do it with their whole heart. This becomes a problem when the ENFP changes his or her mind. Again and again. Yes, focus can sometimes be difficult for this type. But if they can master the art of concentration and hold on to a business idea long enough to get it moving and at least bear some fruit, no type will have more business success than the ENFP. As a bona fide “idea person”, you need to learn to balance your ideas with practicality. It’s wonderful to have so many passions, but passion is empty without some kind of application. Your idea is no better than a discarded light bulb without action. To escape your 9-to-5 pick an idea that you think really has potential, pick a time period and tell yourself that no matter what, you are going to focus on your idea, and nothing else! You have all the tools necessary. What are you waiting for? I have yet to meet an ENFP who is happy in the rat race. This type will be miserable working in a stuffy office. They need to get out, to breathe fresh air, and to work with interesting and other fun-loving people. Fortunately, ENFPs can be among the best at starting their own businesses, as they are full of ideas. An uncommon type, the INFJ is highly attuned to the needs and feelings of others. They are great at watching, observing, and deducing the motivations of everyone around them – but you would never guess that this is the case, as they seem private and quiet people. INFJs are passionate, but this is tempered by a cooler exterior that gives an essence of practicality and realism. They are ideal counselors and teachers, occupations which can be suited to self-employment, especially today. INFJs are not the most likely types to seek out self-employment, as they are more interested in feeling that their careers have meaning rather than freedom. There is a wonderful new career out there that has taken hold in recent years. The professional coach has now encroached on the territory once reserved for psychologists and other professionals with fancy-looking titles. Today it is possible to be a coach of almost anything – career, relationship, lifestyle, health, racquetball – you name it. As long as you have expertise in a field and you can build trust in others, you can be a coach. I can’t think of a better self-employed path for an INFJ. Voila – you are a professional coach! An INFJ can also succeed in other business endeavors, but like most idealists, they will be happiest in a profession where they are making a difference in the world. It is hard for an INFJ to feel passionate about a career unless they feel really connected with what they are doing, and can be really difficult for INFJs to feel justified in charging people for a service they give to their friends for free. Self-employment may not be right for this type. The INFP definitely has it tough. Sensitive and imaginative, this type isn’t cut out for the 9-to-5 world at all. There can also be real barriers to self-employment for the INFP, including shyness, a general lack of assertiveness and an easygoing personality. However, if these barriers can be overcome, there is probably no type better suited to working for themselves. INFPs will work tirelessly on something they believe in. They are highly creative, intelligent and can see the big picture of a business idea. An INFP should actually make it a priority to leave the rat race, even though it might not be easy! With plenty of talent and a dearth of ideas, you should have no trouble brainstorming ways to make your escape. But what you need is to focus, follow through, and assert yourself when necessary. Learn to ask clients to pay you what you deserve. Learn to network and reach out to others within your business. Learn to market your skills. If you can develop these essential business tools, you’ll build a great business that will be your own. As an idealist, an INFP should choose a business idea or profession where they are helping other people. Surprisingly, they can make some of the most interesting and successful businesses happen if they can overcome some of their perceived limitations. This is a type that should definitely consider self-employment even if it is a challenge. Glad you enjoyed my article! I definitely know how it goes – can be quite difficult finding/creating work that is meaningful to you. On the one hand you can look at your work as a means to an end and try to start something that pays the bills while you do something really meaningful with your life on the side. One of the best parts of starting a business is that it can be anything you choose. If you have a skill to offer others, if you can market this skill effectively you can have a business that’s profitable and makes you feel connected to what you are doing. One piece of advice I would say is the pick something that you have considered and focus. Give yourself a trial period to try a business idea out (at least 6 months) and see it through to the end. If it doesn’t work, you can try something else. INFPs are idea people who want to help others… consider a business where you are doing something good for other people – coaching or counseling are good areas to consider. I also got laid off right before I launched my web development solo business. Losing that job was the best thing that ever happened to me! I’m also an INFP. Hi~ I’m an INFP. Perhaps you could give me some insight? or Balanced thought? It definitely sounds like you have found a potentially great school for your continuing education! I definitely know what it’s like to feel passionate about a certain path or place – as an INFP it’s sometimes hard to find a balance between the need to do what feels right with the need to balance my budget. My first thought is this: have you considered other schools that might still offer a program that you are looking for but would be a cheaper alternative? I know your heart is set on the school you have found and it wouldn’t be your top choice – but you might thank yourself for it later and still have a great career as a counselor. At the very least it’s worth considering. If you tried a cheaper school and didn’t like it, you could potentially change your mind early on. I’ve learned that there is no “perfect place” in life – even if you went to that school you might have some tough semesters where you are wondering if you made the right choice. However, you certainly do not have to compromise on your choice of career! INFPs make great counselors and if your heart is set on that path you should definitely follow through. The most financially painless means to getting there might not be the most attractive choice, but I’ll bet that if you did research, found a good alternative, and committed to giving it your best shot you would feel like you made the right decision. And if you feel like you made the wrong choice, you could always change your mind early on and reconsider the first school! the thing i like about this site is thats its not invalidating,I guess that makes me a typical Infp. for who ever see’s this I gave up looking for a job years ago. I personaly feel that as an infp you might very well have to create your own job.Don’t forget were only one percent of the population so we can’t expect to many people to understand us. You might make more gains by improving confidence rather then marching around handing out resumes. thanks again that was a very helpfull synopsis. It is so encouraging to hear from other INFP’s and know that the problems I have faced in finding a career are not just mine. I have run two businesses. One as an Art Restorationist and the other as a Jewellery maker. Both are gone now, thanks to all the problems INFP’s have with life. I did learn one really good piece of information that I would like to pass on. I got from a business teacher, obviously to late to help me. “Don’t try to do all the tasks of a personal business yourself. These tasks consist of financial, promotion, creating/serving. Usually you are good at one, maybe two of these tasks. Find good help to do the other one or two jobs. As an example, there are plenty of great bookkeepers out there if say financial is not your best skill. So don’t try to do everything your self and then get really mad at yourself because you can’t do it and your business is failing. I can say that running your own business is great. Thank you for writing this. I am an INFP and worked on wall st for 7 years. I have always been unhappy and job hopped frequently. I learned I was an INFP 3 yrs ago which explained a lot for I.e. I was always miserable, I could quickly understand the company, and markets, but I never really fit in at a firm. I have found that because we are such a small percentage of the population – we are frequently the recipients of mistreatment. Even if we do a good job but keep to ourselves and are easy going we might not fit in or even around other more common types. As I write this I am dealing with a lot of stress from my current employer regarding my performance. My performance is fine but the real issue is that I don’t fit it and it angers my coworkers to no end. I just want to quit but I need to stick it out to move on. I am working getting out ASAP and starting my own small fitness venture. I really don’t hat all of the cash but I know that I can make it happen. My advice to the young infp is that even if you force yourself to fit in with the herd, they might notice your inherent differences and work to put you out. Great article it clears some doubts about my career path, the thing is that I’m a INFJ, I’m passionate on new ideas and innovation that can add more value to others, but I have a difficult time dealing sometimes with people, definetely I can deal on a one to one relation, how can I be self employed if I wish to mass market any product or service that I want to work with. Regardless, regardless of what you are, we all have the deed to grow, it is our purpose. It is not as easy as it sounds, we as humans can change, improve, etcetera, etcetera… a quote I wrote not long ago “OUR HUMANITY ACTUALLY SURPASSES ALL OF TECHNOLOGY. FOR SCIENCE CRUMBLES, SPIRITUAL WORLD DOES NOT. WE ARE EACH GOD, THE LIGHT OF LIFE…” -A. V. If it is fear stopping you from growing (succeeding) “Turn fear into adrenaline… and your Will succeeds.” -A. V. because “Realizing your feats is done by the essence of motivation… to the extend of what you put in.” -A. V.
I was considered an INFP (we shall not remain categorized, we are at will to change) the dreamer! (In the past my mom always told me to dream, not long ago she’ll say’ stop dreaming and do something with your life. Now in the present my wife tells me “you dream too much, your so intelligent, your words are so inspiring and motivating and so right but you do nothing worthy, you should do something good with your life and that mind of yours”) I was in learning disability classes all through primary and secondary schools. Always in class daydreaming, and barely passing grades on mostly D’s. I actually got kicked out of high-school for too much fighting. However that did not stop me, I got my GED while volunteering in boards of the communities, and starting business but never sticking with them, what a-shame. I always had a drive, a drive when I would be alone, absent from the technology and family, I actually grew, successfully. I was more productive. I found out it was actually my personal habits, and material distractions that stopped me from being successful. Even though it can be hard to avoid such impediments, it can be had. I had it ruff then, and now… with a wife and kids, taking care of my kids, and to support wife so that she may finish college, it was difficult. It takes no strength to drive will, rather a heart, mind and spirit combined. I was an introvert, however I changed everything I can to improve, to become extrovert and stay in between, by choice. I attended public speaking seminars, and other positive life changing seminars/classes. “If you don’t move, you gain nothing! If you move you gain a piece closer to success.” To this day I continue to grow, beyond my dreams. I am forever grateful for being an INFP, it made me street-smart and book-smart. Want to know more, about me? I loved reading this and the comments! I am an INFP, and I relate to the struggles you and others have mentioned. I’m very intrigued that mostly INFPs have responded in the comments. I am glad to know that I am not the only one who has a hard time fitting into employment and/or doing my own business. Thanks! Funny, I’d posted this question on a forum for INFPs a long time ago, asking whether any of them had had trouble finding a decent job. None of them had, apparently. I felt that maybe I was the only and that I must have some sort of problem until… I came across this wondrous article! Thanks for writing it! Challenge with starting a business is that earning a living as a writer and a musician is extremely difficult. I wish someone had real, concrete suggestions as to how to do that. I’ve seen the studies that say “writer” and “musician” are ideal jobs for INFPs, and I agree with that as it is true in my case…but… no one wants to address how difficult it is to make money in those fields. A support group would be helpful too. I’ve thought of starting one but it’s often hard to find the right people who will be supportive of each other. Also when I try to talk about money problems with people I get the positive thinking nonsense thrown at me. Ex: “Don’t say you ‘don’t have any money,’ tell yourself, ‘I don’t have any money at this moment but I will someday…” Honestly, that’s nonsense. People don’t “manifest” great wealth by just changing their thoughts. Sorry, but I don’t believe in positive thinking. I need to be practical. I liked this article, so I’m not criticizing it. It’s very thought provoking. I just wish there were more resources available to those of us who are unemployed or underemployed–not because we’re defective or disabled, but because there aren’t any jobs available that are appropriate for us. I’ve tried getting help from places like SCORE but they weren’t able to help me decide which business to start and how to get it started. Most business mentors will only help you if you already know what business you want to start and are already making some money. I suppose it’s too difficult to help people who are just starting out. Great post! I am a definite ENFP and have always had the desire to strike out with my own business. I’ve got my Marketing Agency running in the last 9 months and will take on your tips an things to look out for. I have a husband who is an ISTJ, so it always helps to get his view on things. Great post! I am a definite ENFP and have always had the desire to strike out with my own business. I’ve got my Marketing Agency running in the last 9 months and will take on your tips and key things to look out for. I have a husband who is an ISTJ, so it always helps to get his view on things as he has a very different perspective. Great post! I’m an INFP, and so as I was reading this, I was thinking “Wow, this is really spot on! The writer must have really done their research on what it’s like to be an INFP or must know an INFP or something…” then I read that you’re an INFP too, and it all made sense. Ha. I started an internet marketing business and it’s been one of the most challenging things I’ve ever done! It’s hard for me to negotiate and sell myself sometimes. And having tough conversations with clients who owe me money is so, SO hard. But I definitely enjoy the freedom and I think entrepreneurship is a great idea for INFPs. They just have to get over their need for perfection and overcome their sensitivity to criticism (which is incredibly challenging and takes a lot of maturity). If they can do that, then I think they can do a great job because they’re passionate and hard working and really care—all great qualities for a business owner. Thanks, Reannon! Its funny, when I wrote this article in 2010 I resonated more with INFP. Today I have no doubt that I’m really probably an ENTP, but that I’ve changed over time. I think that personality typing can be flexible and change depending on the directions you choose to grow. You can either choose to develop into the healthiest version of your type over time or embody traits of other types. Honestly in my case it was more of a natural progression. I would agree with your assessments of the INFP in business, and I would also add that INFPs are great at connecting with others and getting in their shoes, if they choose to do so. This is a very important trait to embody if you are going to successfully read your clients. And as you mention, passion is important as well!